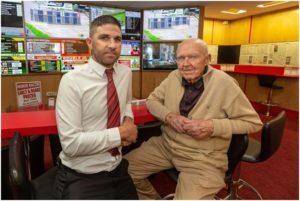 An 83-year old grandfather has become an internet sensation since his CCTV footage of fighting armed robbers has gone viral on the internet. Denis O’Connor from County Cork, Ireland, is quite a man for an 83-year old person. 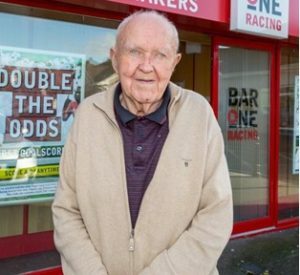 The granddaddy was in the Bar One Racing in Glanmire, Country Cork, on Saturday when three robbers burst into the bar. While two robbers were armed with hammers, the third one had a shotgun. In the video, the robbers can be seen breaking into the bar through the main door and threatening the shop manager, Tim Murphy. Out of the three customers seen in the video, only O’Connor showed the guts to fight off robbers. He can be seen trying to help Tim by fighting off the robbers in the counter area. The counteraction by O’Connor frightened the robbers and made them leave the bar. Both Connor and Murphy tried to hold the thieves but they somehow managed to run out of the bar. Watch the video and see how Denis O’Connor made the armed robbers run for their lives. Well, what Denis O’Connor did is really a commendable effort from him. What do you think of his courageous effort? Would you have also shown the guts to fight off robbers? Let us know your opinions in the comment section below.